technology, courts, law enforcement, corrections, and every level of government, including U.S. embassies worldwide. 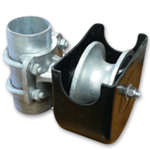 Standard, AC SlideDriver models are rated continuous duty and are certified with a 200,000 cycle test. Many SlideDrivers in the fi eld have opened gates for decades and have accrued over a million cycles. 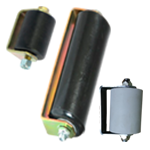 SlideDrivers have few moving parts and obtain their power from 2 (or 4, for SlideDriver 200) hydraulic motors. Their industrial grade hydraulic system performs as well in the intense heat of the Sahara as in Alaskan permafrost. U.S. Department of Defense independent testing concluded that hydraulic, rigid drive rail slide gate operators off er signifi cantly increased reliability and lower maintenance (higher ROI) than other slide gate drive systems. Most SlideDrivers move gates at 12-inches per second. Other models move gates between 20 and 36 inches per second. They come in models that move gates weighing up to 20,000 lbs. 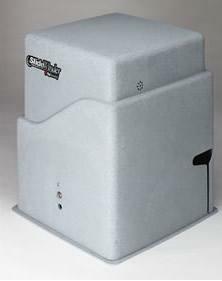 ; in modular versions that reduce operating noise and increase security by remotely locating controls and electric motors; in UPS battery backup models for continued operation during AC power loss; in correctional facilities or other high security models with tough locks and heavier duty covers; with stainless steel chassis for highly corrosive environments and in combinations of these models. The fully enclosed hydraulic motor drives a rigid drive rail passing between two compressed urethane wheels for ultimate traction in dry, wet, snowy, or icy conditions. 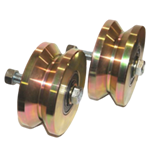 SlideDriver’s industrial-grade hydraulics allow for severe cold and intense heat operation (from -40F to 167F; -40C to 75C). Its motors, hydraulics and controls are securely housed in a rigid 12 gauge sheet metal chassis prime painted with a textured paint fi nish yielding an enduring, attractive appearance. The chassis has been tested to withstand a 1,000-hour salt spray. 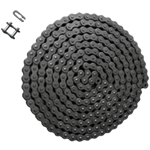 SlideDriver features the most advanced, fl exible and robust controls in the industry. The Smart Touch Controller often eliminates the high cost of add on, programmable logic controllers (PLCs), providing on-board integration for even the most complex perimeter security applications. Programmable options include anti-tailgating, warn before operate, master/slave, partial open, and timer-to-close. 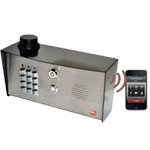 Three user relays off er 26 programmable options, making it easy to connect SlideDriver to any external access control, obstruction protection, or security device and create complex vehicle entry validation, surveillance, and sequencing. Relays have normally-open or normally-closed connections. faults, alerts and errors, and Smart Touch LEDs light up to show circuit status. Hours of costly and complicated access control and gate system troubleshooting are saved using SlideDriver’s Smart Touch troubleshooting tools. 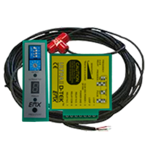 SlideDriver models run on nearly any available worldwide voltage. Available in DC models (UPS) that continue to operate for 3000 feet of travel during an AC power outage. SlideDrivers come with a limited 5-year manufacturer’s warranty. • Motors, hydraulics, and controls are securely housed in a sturdy and rigid 12 gauge galvanized sheet metal chassis with a prime painted, textured paint fi nish, yielding an enduring, attractive appearance. Tested to withstand 1,000-hour salt spray. • Operates from 1 to 3 feet per second. Opens gates weighing up to 20,000 lbs. ; gate length is only limited by weight. • All AC models rated to continuous duty (200,000 cycle certifi cation), with many exceeding 1 million cycles and 20 years of service. 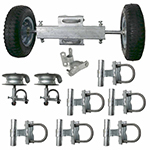 • Eff ortless sequence control integration with HySecurity StrongArm or SwingRiser for tough anti-tailgating operation. • Combination StrongArm, SlideDriver, or SwingRiser users benefi t from common hydraulic and electrical components and software. 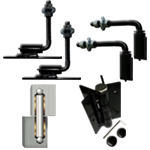 This reduces maintenance costs, avoids excessive parts inventory and eliminates complex, multiple-brand troubleshooting. Facilities personnel need to know only one simple operating system. • Superior operator and system troubleshooting using a downloadable event/fault log to troubleshoot loops, vehicle detectors, as well as, gate system, operator, and user issues. 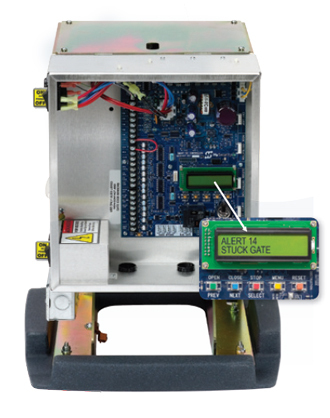 On board LCD reports real-time loop, system, operator, and user errors. Board LEDs show circuit status. 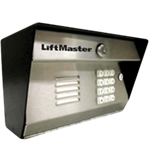 • Security integrators or end-users choose from numerous programmable options including anti-tailgating, reversedelay, master/slave, leaf delay, partial open, and timer to close functions. 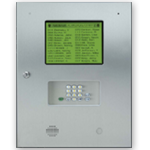 • Three user relays off er 32 programmable options, making it easy to connect SlideDriver to any external access control, obstruction protection, or security device and create complex vehicle entry validation, surveillance, and sequencing without the addition of costly, custom programmable logic controllers (PLCs). Relays have optional normally-open or normally-closed connections. • Easy drive wheel disengagement for manual operation. 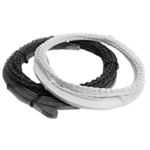 • Available in nearly all domestic and international single-phase and three-phase voltages. 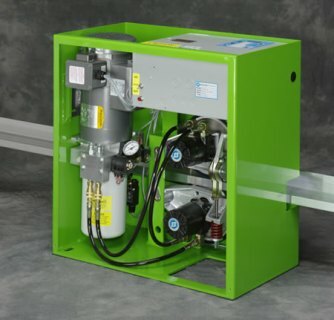 • Industrial-grade hydraulics certifi ed from -40 to +167F (-40C to 75C) temperatures, from bitter permafrost to broiling desert conditions. Available in standard and solar versions, SlideSmart DC is an electromechanical, chain driven slide gate operator ideal for residential, commercial and light industrial applications. DC battery backup provides continuous operation, even during power failure. SlideWinder is HySecurity’s elegant, fl exible, secure, and reliable commercial/residential slide gate operator. 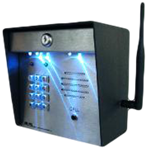 It provides the unparalleled user advantages of HySecurity’s feature laden Smart Touch Controller, the elegance of a clean, quiet, and nearly maintenance-free stainless steel cable drive, and the security of thousands of feet of gate travel after an AC power loss. Install this gate operator where most gate operators fail: close to a residential living area or anywhere where quiet operation is essential. SlideWinder is “whisper quiet.” You’ll hear the gate and gate hardware before you hear the operator. swing, barrier arm and vertical lift operators. 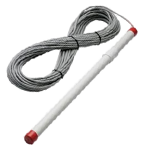 SlideWinder features the most advanced, fl exible and robust controls in the industry. 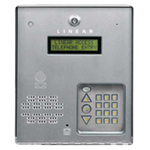 The Smart Touch Controller often eliminates the high cost of add on, programmable logic controllers (PLCs), providing on-board integration for even the most complex perimeter security applications. Programmable options include vehicle detector reverse or pause only, partial open, master/ slave, and timer-to-close. 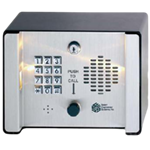 Three user relays off er 26 programmable options, making it easy to connect SlideWinder to any external access control, obstruction protection, or security device and create complex vehicle entry validation, surveillance, and sequencing. Relays have normally-open or normally-closed connections. eye troubleshooting to conclude gate “failure to operate” conditions. 1) A real time or downloadable fault, alert and error log that reports tailgating, gate forced open, loop failure (with HY-5A vehicle detectors) and many other gate operation abnormalities. 2) The Smart Touch LCD screen reports faults, alerts and errors. 3) Smart Touch LEDs light up to show circuit status. Hours of costly and complicated access control and gate system troubleshooting are saved using SlideWinder’s Smart Touch troubleshooting tools. battery back up systems “open and die,” or “close and die,” when AC power is lost. 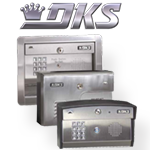 They also lose the function of all safety and access control equipment during that last 1/2 cycle. 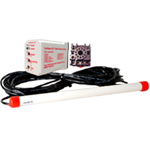 SlideWinder keeps energy effi cient access controls and photo eyes functioning when operating on battery power. 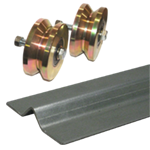 As with all HySecurity operators, SlideWinder is manufactured with industrial grade components or better, and is design engineered for the longest, low maintenance, high performance life available. SlideWinder 24 moves an up to 1,200 lb. gate at 12-inches per second. This model generates up to 24 feet of gate travel (limited by the size of SlideWinder’s cable drum). SlideWinder 38 moves an up to 2,000 lb. 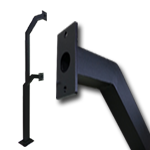 gate between 9-inches and 24- inches per second (fi eld adjustable). 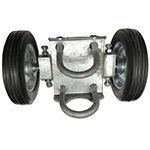 This model generates up to 38 feet of gate travel with its larger capacity cable drum. number of batteries are based upon site solar insolation, gate weight/rolling resistance, and gate cycle expectations. 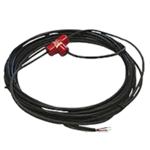 All SlideWinders operate using any worldwide single phase current without special wiring. SlideWinders are backed by a limited 5-year manufacturer’s warranty. 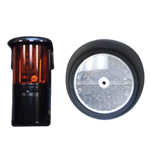 • SlideWinder comes with a UPS battery back-up standard, generating 1,000 feet of gate travel after AC power loss. • Battery back-up keeps obstruction protection, access controls, and other peripherals running during AC power loss. • Optional 110 amp hour batteries increase backup operation to 25,000 feet during power outage (user to provide external battery enclosure). • Moves gates up to 2,000 lbs. at up to 24” per second. See model descriptions. 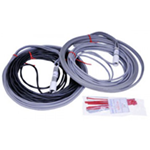 • Operates with a clean, maintenance free, stainless steel cable drive. No lubrication. No tightening. No mess. No hassle. • Housed in an appealing, granite color polyethylene cover. confi guration, and site insolation. • Choose from numerous programmable Smart Touch options including reverse delay, partial open, and timer to close. • Superior and easy integration with HySecurity StrongArm for tough anti-tailgating techniques. 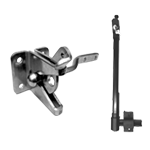 • Combination SlideWinder, StrongArm, SlideDriver or SwingRiser users benefi t from cross platform part and functional compatibilities that reduce maintenance costs, complicated system troubleshooting, and excessive parts stocking. • SlideWinder off ers superior operator and system troubleshooting using downloadable event/fault log to troubleshoot loops, vehicle detectors, gate system, operator, and user errors. 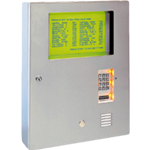 Integral LCD reports realtime loop, system, operator and user errors. Board LEDs show circuit status. • Uploading new software to fl ash memory updates operator to latest features. • Easy manual operation by turning off power and back driving gate. • Limited 5-year manufacturer’s warranty.